This morning’s YouGov poll for the Sun has topline figures of CON 33%, LAB 42%, LDEM 10%, UKIP 8%. A nine point lead today, but YouGov have shown three twelve point Labour leads over the last week, so the underlying average appears to be creeping upwards. I’m always somewhat wary of overanalysing small changes in the polls. There is, after all, not much difference between a couple of consecutive polls at the top of the margin of error (particularly either side of a bank holiday weekend) and a genuine movement in opinion. Still, it is certainly worth keeping an eye on, especially as the silly season ends and we get back into politics as usual. Last night’s YouGov poll for the Sun has topline figures of CON 32%, LAB 44%, LDEM 10%, UKIP 8%. There is also a new TNS BMRB poll out with topline voting intention figures of CON 31%(-1), LAB 40%(-2), LD 11%(+1), Others 18%(+2). Changes are from their last poll a week ago. Up to now TNS have been conducting voting intention polls every month or so, but I understand this is the start of a shift to regular weekly polls. A lot of the points I made in my essay on how not to report polls boiled down to not taking a poll in isolation. Not making the outlier the story, only comparing apples to apples, not cherry picking – they all boil down to similar things, especially on voting intention. In the last couple of days I’ve watched people getting overexcited over two polls. Yesterday’s ICM poll provoked lots of Tory excitement on Twitter and comments about the Labour lead falling and it being a terrible poll for Labour and so on. ICM’s poll, of course, did not show Labour’s lead falling at all – it showed it steady for the fourth month in a row. ICM’s methodology merely produces consistently lower leads for Labour due to their methodological approach. Saturday night had the usual flurry of excitable UKIP comments on Twitter about being on the rise and being the 3rd party after the Survation poll was published, conveniently ignoring the fact that 95% of polls this year have had them in fourth – often by a very long way. There was, needless to say, no similar excitement over UKIP being on 4%, 11 points behind the Lib Dems, in the ICM poll yesterday. YouGov, ICM and ComRes’s online polls tend to show the highest shares of the vote for the Conservative party. 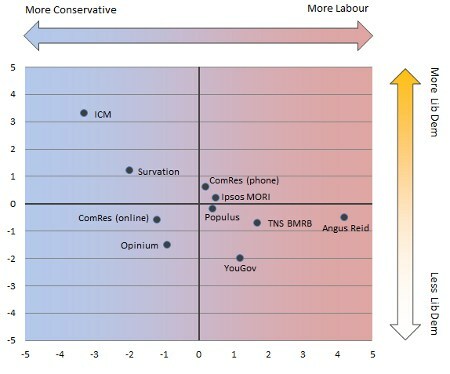 However, in the case of YouGov this is cancelled out by a tendency to also show the highest levels of support for Labour, so the result is that ICM show the lowest Labour leads while YouGov tend to show some of the highest Labour leads after Angus Reid and TNS. For the Liberal Democrats, ICM show far higher support for the party than any other company, averaging at plus 3.3 points. Next highest is Survation and ComRes’s telephone polls. At the opposite end of the spectrum YouGov tend to show significantly lower Liberal Democrat support. How pollsters account for likelihood to vote. Some companies like YouGov and Angus Reid do not take any account of how likely people say they are to vote away from elections(2). Companies like ICM and Populus weight by how likely people say they are to vote, so that people who say they are 10/10 certain to vote count much more than someone who says their chances of voting are only 5/10. At the opposite end of the scale from YouGov, Ipsos MORI include only those people who are 10/10 certain to vote, and exclude everyone else from their topline figures. Other twists here are ICM, who also heavily downweight anyone who says they didn’t vote in 2010, and ComRes, who use a much harsher likelihood to vote question for people voting for minor parties than for the big three. Most of the time Conservative voters say they are more likely to vote than Labour voters, so the more harshly a pollster weights or filters by likelihood to vote the better it is for the Tories. How pollsters deal with don’t knows. Somewhere around a fifth of people normally tell pollsters they don’t know how they would vote in an election tomorrow. Some pollsters like YouGov simply ignore these respondents. Some like MORI ask them a “squeeze question”, something like “which party are you most likely to vote for?”. Others estimate how those people would vote using other information from the poll, such as party ID (ComRes) or how those people say they voted at the previous election (ICM and Populus). These adjustments tend to help parties that have lost support since the last general election – so currently ICM and Populus’s adjustment tends to help the Liberal Democrats and, to a lesser extent, the Conservatives. In past Parliaments it has helped the Labour party. How the poll is conducted. About half the current regular pollsters do their research online, about half do it by telephone. While there is no obvious systemic difference between online and telephone polls in terms of support for the Conservatives, Labour and Liberal Democrats there is a noticable difference in support for UKIP, with polls conducted online consistently showing greater UKIP support. This may be to do with interviewer effect, with respondents being more willing to admit supporting a minor party in an online poll than to a human interviewer, or may be something to do with sampling. How the poll is weighted. Almost all pollsters now use political weighting of some sort in their samples. In the majority of cases this means weighting the sample by how people said they voted at the last election – i.e. we know 37% of people who voted in Great Britain in 2010 voted Tory, so in a representative sample 37% of people who say they voted at the previous election. It isn’t quite as simple as that because of false recall – people tend to forget their vote, or misreport voting tactically, or claim they vote when they didn’t actually bother, or align their past behaviour with their present preferences and say how they wish they had voted with hindsight. Most pollsters estimate some level of false recall in deciding their weighting targets, Ipsos MORI reject it on principle with the effect that proportionally their samples tend to contain slightly more people who say they voted Labour at the last election, and somewhat fewer who say they voted Lib Dem. How the poll is prompted. As discussed at the weekend, almost all companies prompt their voting intention along the lines of Conservative, Labour, Lib Dem, Scots Nats/Plaid if appropriate and Other. Survation also include UKIP in their main prompt, leading to substantially higher UKIP support in their polls. Inevitably the question arises which polls are “right”. The question cannot be answered. Come actual elections polls using different methods all tend to cluster together and show very similar results – polls have a margin of error of plus or minus 3%, so judging which methodology is more accurate based on one single poll every five years when all the companies are within the 3% margin of error is an utter nonsense. Realistically it a more a philosophical question than a methodological one – the reason pollster show different figures is that they are measuring different things. YouGov don’t make second guesses about don’t knows and assume everyone who says they vote will. Their figures are basically how people say they would vote tomorrow. In comparison ICM weight by how likely people say they are to vote, assume people who didn’t vote last time are less likely to do so than they say they are, and make estimates of how people who say don’t know would actually vote. Their figures are basically how ICM estimate people would actually vote tomorrow. They are two different approaches, and there is not right answer as to which one to take. Shouldn’t a pollster actually report what people say they’d do, rather than making second guesses about what they’d really do? But if a pollster has good reason to think that people wouldn’t behave how they say they will, shouldn’t they factor that in? No easy answer. Given these differences though, when you see a poll, it is important to remember house effects and to look at the wider trends. A poll from ICM showing a smaller Labour lead than in most other companies’ polls isn’t necessarily a sign of some great collapse in Labour’s lead, it’s more likely because ICM always show a smaller Labour lead than other companies (ditto a great big Labour lead in an Angus Reid poll). That said, even a big Labour lead from ICM or a small Labour lead from Angus Reid shouldn’t get people too excited either, as any single poll can easily be an outlier. As ever, the rule remains to look at the broad trend across all the polls. Do not cherry pick the polls that tell you what you want to hear, do not try to draw trends from one company to another when they use different methods and don’t get overexcited by single outlying polls. ICM’s monthly poll for the Guardian has been published. Topline figures with changes from last month are CON 34%(nc), LAB 39%(nc), LDEM 15%(+1), Others 12%(-1). Changes are from ICM’s last poll in July. Full tabs are here. I am always a little wary of conducting polls over bank holiday weekends – there’s always the worry that it might get a weird and wacky sample because of people travelling or going out. In this case though the poll looks very normal and very much in line with ICM’s recent polling, showing no significant change from their last couple of polls. ICM tend to show some of the smallest Labour leads of the main pollsters, partly because they re-allocate some of the voters who say don’t know based on polling evidence from past elections that many of these voters are likely to end up voting for the party they voted for at the previous election. In this instance reallocation of don’t knows closed the Labour gap from 9 points to 5 points, and increased reported Lib Dem support by 3 points. The poll also asked who people would like to see lose their job in the forthcoming reshuffle – 48% of people said they think George Osborne should lose his job. As with other polls on Osborne, the answers to this are quite partisan, with a majority of Labour supporters saying Osborne should go. Even amongst Tory supporters though 29% think that Osborne should be replaced. The weekly YouGov results for the Sunday Times are now online here. Topline voting intention figures are CON 34%, LAB 43%, LDEM 10%, UKIP 6% – still very much in line with the 9-10 Labour leads that YouGov have been averaging about of late. The rest of the poll dealt mainly with the economy and the photos of Prince Harry. Economic figures remain extremely bad. 80% of people think the economy is in a bad state and only 9% expect it to get better over the next twelve months. On George Osborne himself, only 14% think he is doing a good job as Chancellor and only 18% think David Cameron should keep him in the role, compared to 54% who want him replaced. Answers to the latter question remain very split along partisan lines – a majority of Labour and Lib Dem voters want Osborne replaced, amongst the Conservative party’s own supporters 29% think that Osborne should go, 47% that he should stay. On the deficit, 75% of people think that it is very or fairly important that the government reduces it, but only 22% of people think that the government are doing well at this so far (60% think they are not). Asked about various measures to address the deficit or improve the economy, the most popular is a reduction in regulation (probably because it doesn’t come with an direct economic cost so looks like an “easy” option compared to the others presented), this is followed by borrowing more to spend on large infrastructure projects. Least popular would be increasing taxes, or borrowing money to cut taxes. Turning to the Prince Harry photos, 60% of people said the papers were right NOT to publish the photos, with 28% saying they should have been published. 68% say Harry’s behaviour was acceptable for a young single man having fun on a private holiday and the photo does not appear to have done any damage to public perceptions of him. 13% say it makes them think more negatively about him, but 12% say it makes them think more positively about him. 71% say it makes no difference to their view. Overall 75% say they have a positive opinion of Harry, compared to 20% who have a negative opinion. More generally 45% of people say the press report too much of the royal family’s private lives, 10% that they give them too much privacy and don’t report stories that are of legitimate public interest, 35% think the balance is about right. Finally on opening hours, 44% would support abolishing Sunday opening rules, 37% support going back to the usual rules after the Paralympics, 11% would support a complete ban on large shops opening on Sundays. There is also a Survation poll in the Mail on Sunday – their topline figures are CON 30%(+1), LAB 37%(nc), LDEM 10%(-3), UKIP 12%(nc), Others 10%(nc). Changes are from their previous poll at the beginning of June. The high level of UKIP support looks eyebrow raising, but is pretty typical for Survation and is due to methodological reasons (Survation include UKIP in the main prompt alongside the Conservatives, Labour and Liberal Democrats).